Last week I mentioned that Jonathan Miller and Elliman had released the so-called Manhattan Phonebook. The report is the yearly review of price trends for all of Manhattan's regions and neighborhoods (is it a coincidence that the actual phonebook was delivered last week also — at least in Brooklyn it was). Anyway, I was finally able to do a quick and dirty comparison of DoN's median apartment prices for Manhattan from 2003-2009 against Elliman's data. 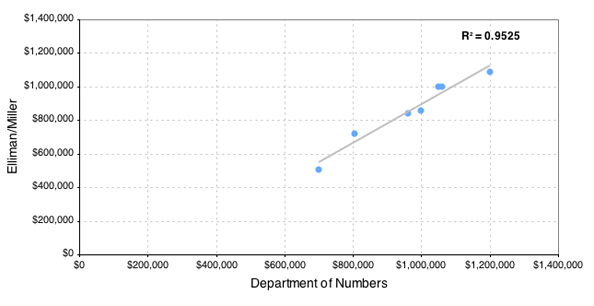 Below are the scatter plots along with R2 values for CO-OP and Condo median prices respectively. 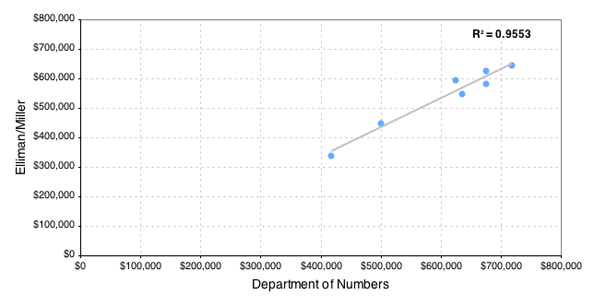 As you can see, there is a visible linear relationship for the two price metrics. Both R2 values are above 0.95 which implies that the variables are moving together with a relatively small amount of unexplained variation. This unexplained variation is probably due to methodology differences. Elliman's data goes back to 2000 while published public records (which DoN's numbers are based on) only go back to 2003. It may be that Elliman employs a slightly different procedure to keep their time series self consistent over that longer record. In my opinion this is pretty impressive agreement for two independently developed techniques for measuring aggregate price trends. Site note: As promised, quarterly metrics are now available city-wide. Check it out.